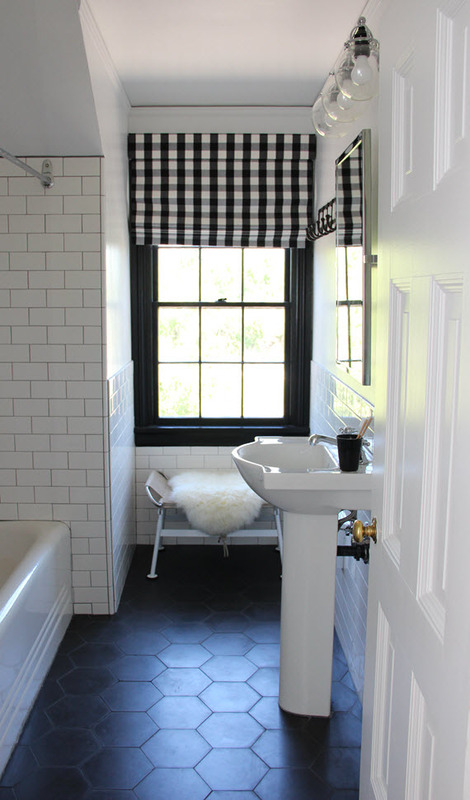 I’ve been following the latest One Room Challenge on Instagram – have you? As you may know I participated in the past; redecorating our foyer and then renovating our master bathroom… in 6 weeks no less! The pressure is real and so I was feeling for the latest group of decor bloggers that took on the challenge. The final design reveals were published last week and are super fun and creative. It was so hard to narrow down, but I’ve selected five designs to share with you today. 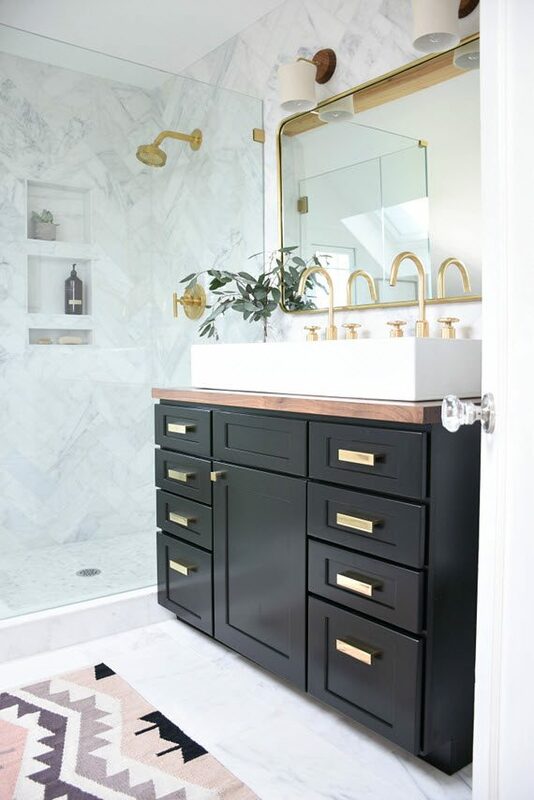 The black vanity with brass hardware in the master bathroom designed by House Updated is fabulous. 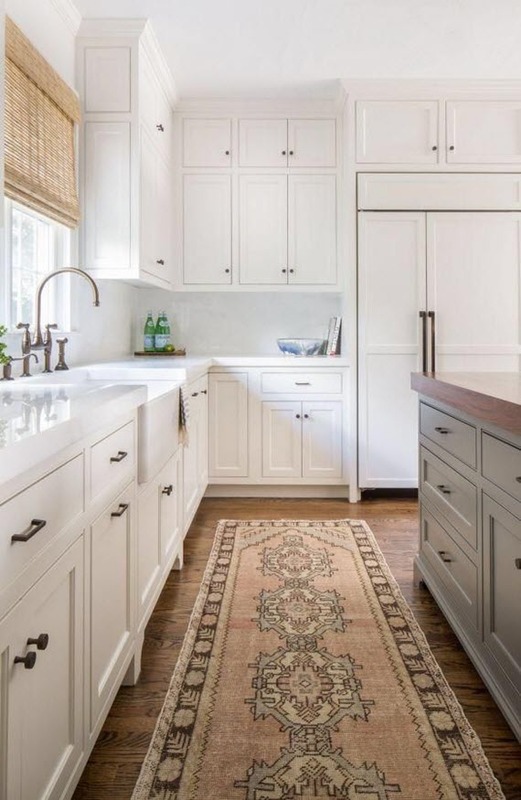 The tribal rug with pale pinks and gray works beautifully with the marble flooring and herringbone walls. Love the rounded brass mirror too. 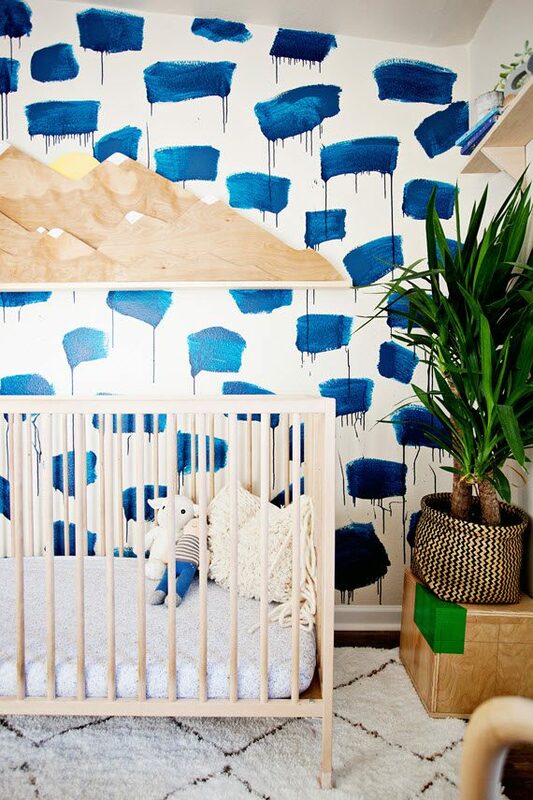 This serene, yet sophisticated gender neutral nursery room by chris loves julia is another fave. It was designed for her baby girl-to-be, but I think would work for a boy too. 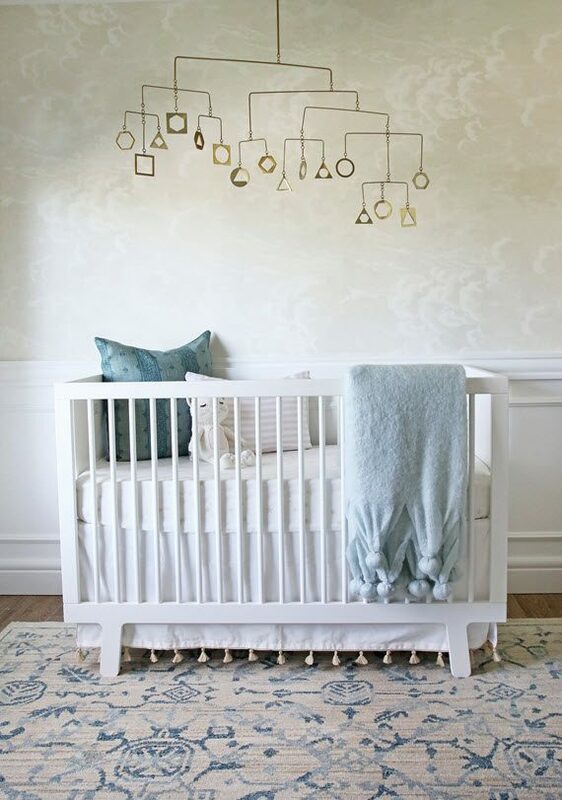 The brass geometric mobile is a super chic touch, don’t you think? 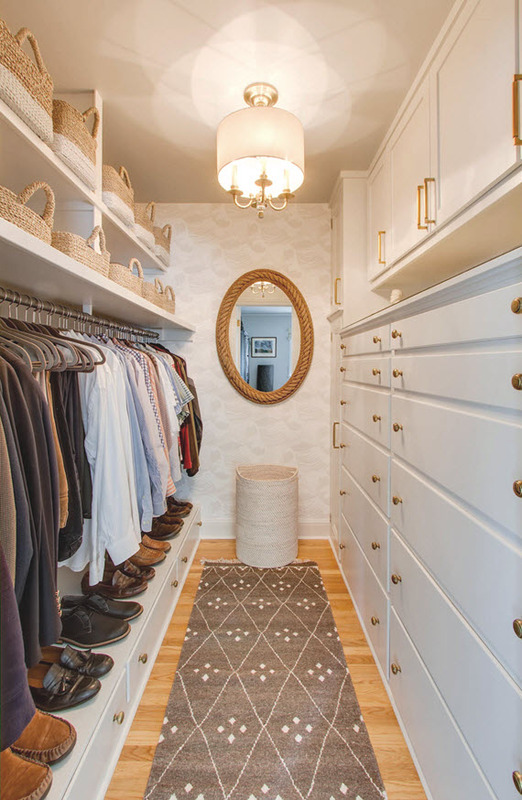 House of Brinson‘s guest bedroom and dressing room is also spectacular. The walls are covered in an aged blue gray paint by Farrow & Ball and panels of Gracie wallpaper hang in the dressing room (shown above). Simply stunning. The dining and sitting room design by The Pink Pagoda is another show stopper. 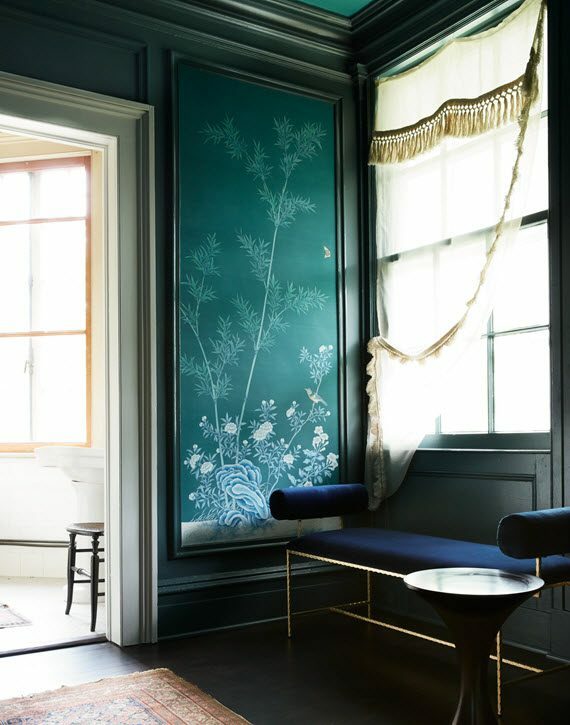 The traditional design is layered with chinoiserie and modern touches. 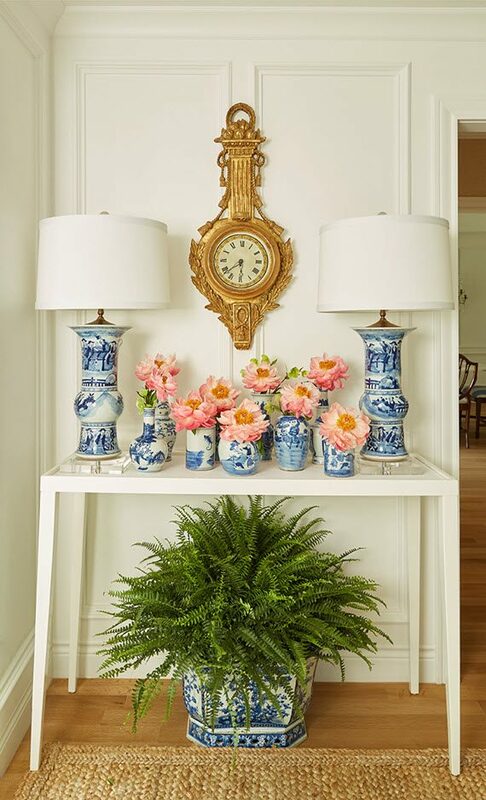 I’m loving this vignette in particular… and look a fern! 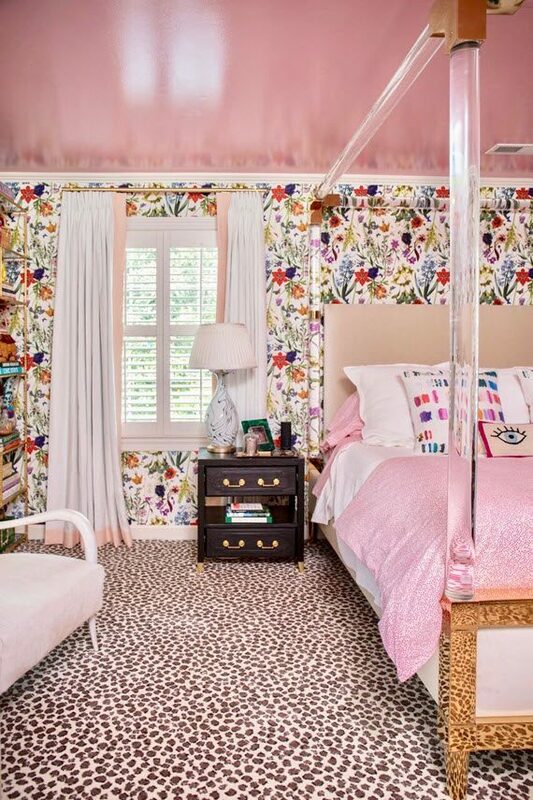 At first glance, this bedroom seemed it was designed for a teenage girl, but it’s actually the master bedroom for blogger Holly from The English Room. She is known for her bold, colorful and multi-layered designs. Don’t you love the lucite bed! And be sure to check out all the fabulous One Room Challenge Spring 2017 reveals at Calling it Home. So fun! Full of life, love and laughter – I’m a fan of children’s spaces. Decorating for your little one doesn’t have to be overly cutesy or themed. 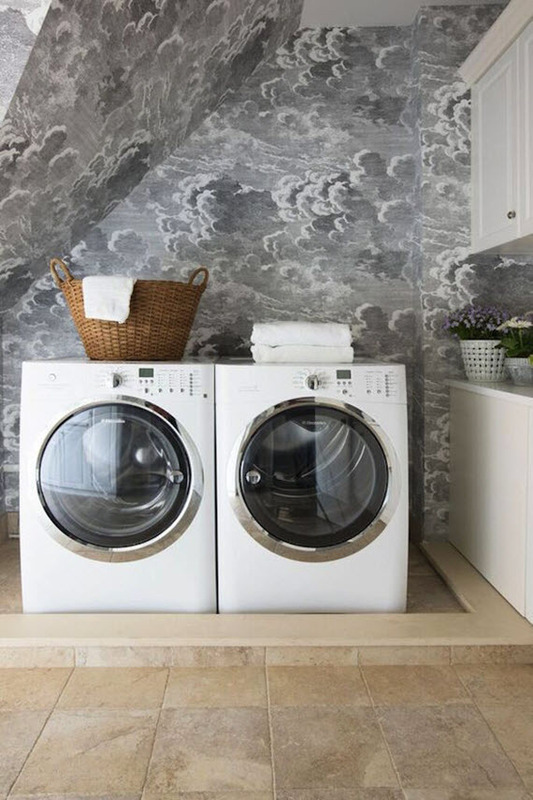 Infusing some grown-up touches through furnishings, artwork or textiles can help add a sophistication to the space that helps it stand the test of time. Today I’ve round-up some fresh kids room ideas that feature design elements that both kiddos and parents will love. This sweet bedroom by Joni of Lay Baby Lay showcases the boy’s love of Star Wars (fun artwork!). I love the modern touches and that the theme is subtle. 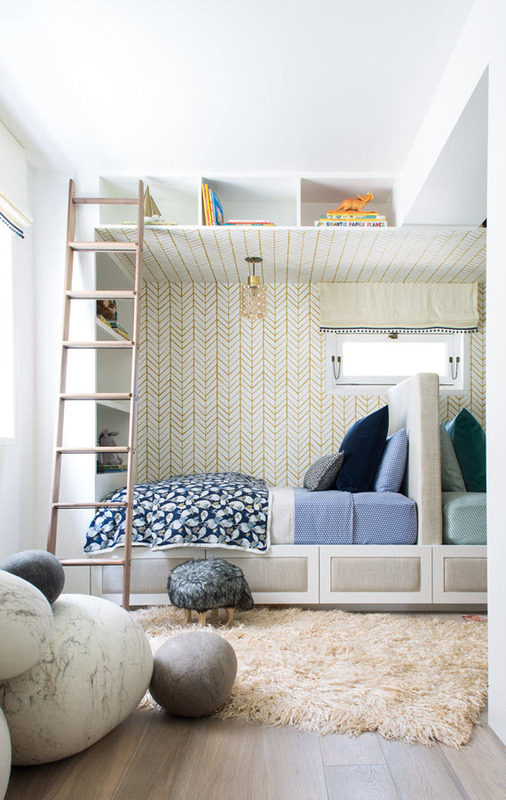 The book wall is this gender neutral kids’ bedroom is darling – it would also work behind a desk in a home office! 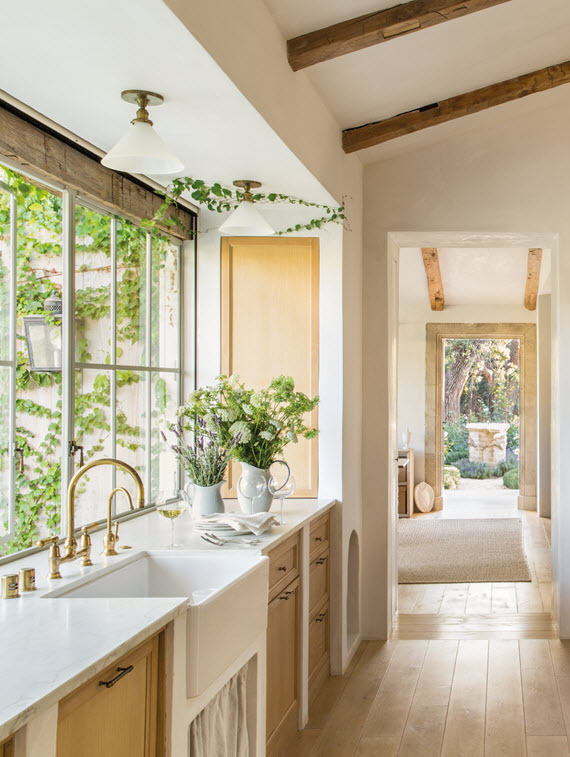 The room designed by Jillian Scott was spotted in Rue Magazine. 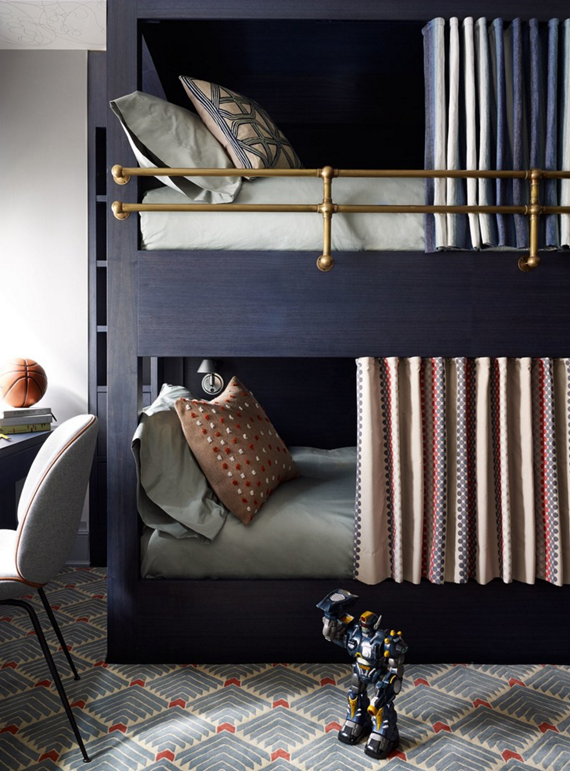 Bunk beds are a great option for smaller kids’ bedrooms. I love this navy bunks with privacy curtains & brass rails in a Manhattan apartment decorated by Elena Frampton and seen in Architectural Digest. So sharp! 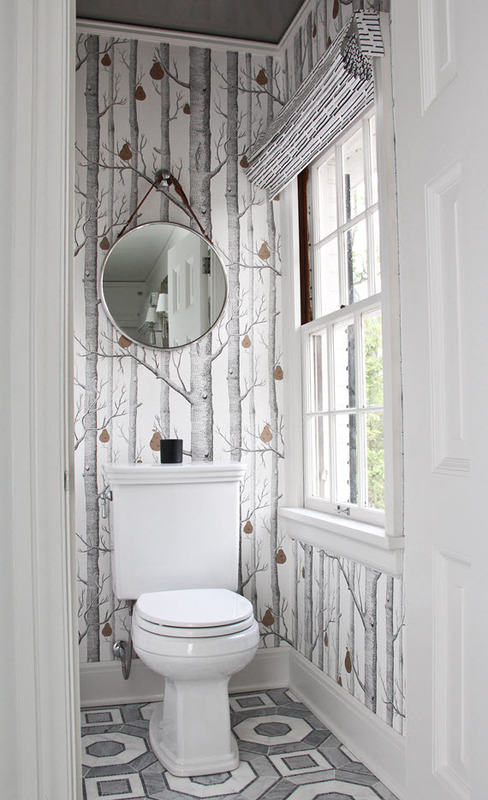 Don’t you love this fun painterly wallpaper?! It’s just darling as an accent in this baby’s nursery by Sarah for A Beautiful Mess. 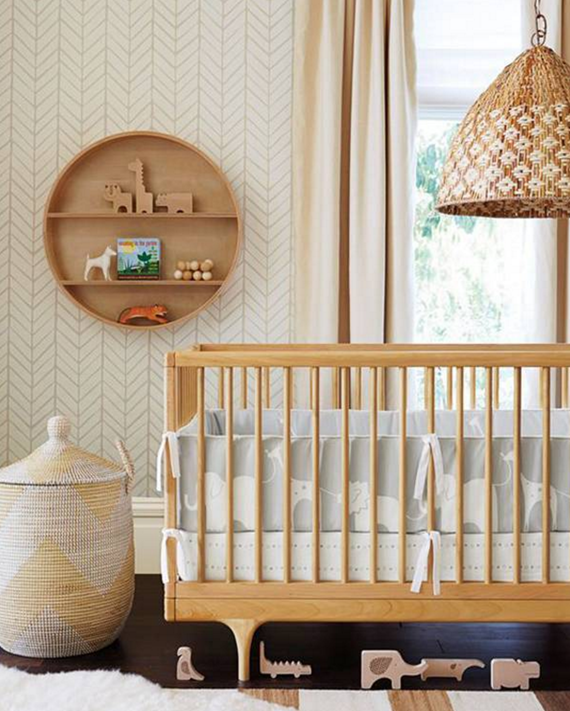 I’m also loving the neutral herringbone wallpaper featured in this sweet girl’s nursery room by Studio McGee. 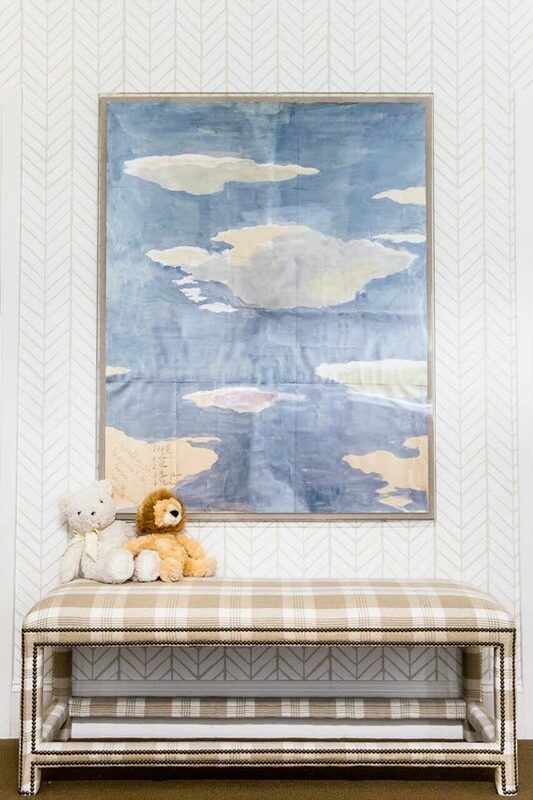 The timeless plaid upholstered bench adds a fun play on pattern too. This Southwestern chic bunk room features a fun hanging chair, tiered bunks and super fun cactus wall detail (it was a diy project!). Spotted also on A Beautiful Mess. As I welcome 2017 with open arms, I also reflect back on this past year. 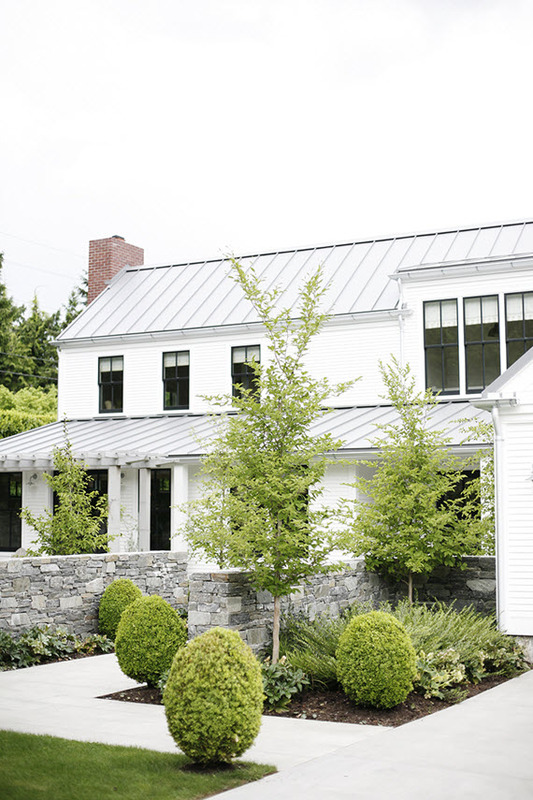 As you may know, we moved into a 1940s home that desperately needed a face-lift, so for the last year and a half we have been in the process of various renovation projects. In fact much of the last year we were in the mist of several projects which included the kitchen & great room, three bathrooms, and a laundry room. 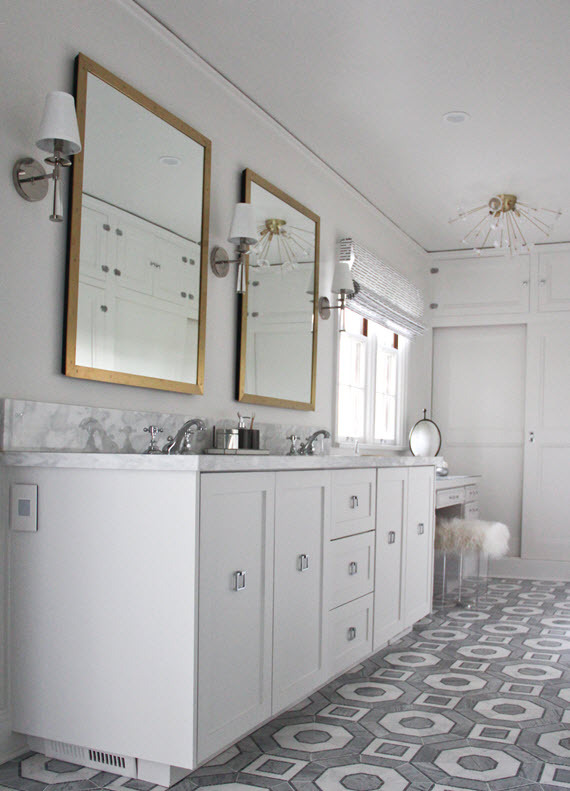 Each project brought challenges and joy along the way – some which I have already shared like the process of designing our master bathroom & closet and guest bathroom. Once I catch my breathe and get some photo taken, I’m planning on revealing some of the other projects we undertook in the upcoming months.